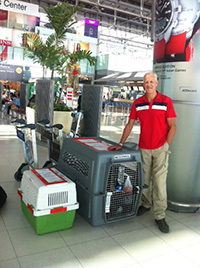 Process rescue−How to send a dog to Canada. and socialized puppies. My friends in Canada have also accepted dogs from Bangkok. The first issue is to find a prospective owner in Canada. I will not send a dog home unless they have a owner already arranged or going to the Toronto Humane Society. 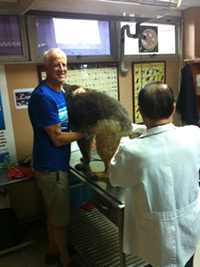 The dog, then get his rabies shot and all his vaccination and is neutered or spayed. The first thing is to book the plane back to Canada! You can only fly with 2 dogs! To fly with a dog back to Canada cost about 320$US. To send a dog a dog cargo usually cost about 800$US. So far I have sent about 35 dogs back to Canada and found lovely homes for all them. 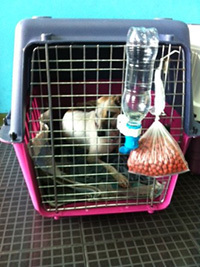 3 days before departure, the dog must go to the quarantine office at the Bangkok airport for inspection. If all goes well, I get the license airport and official health certificate needed to fly. Quite an easy procedure once you know what to do! It is just a routine for me now! And everyone at the quarantine office knows me now and calls me by my first name!